Rent entire building - convenient for larger groups max. 28 persons with apartment 38 perosons. Lift for children free of charge. 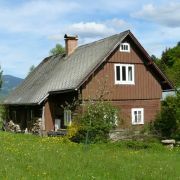 Cottage in beautiful location called Nýčovy domky uppon the village Desna, about 9km far from Harrachov. Capacity … More » about 17 persons, 5 rooms, kitchen, bathroom, 3xWC. Hearthstone, TV/sat. Playground, small swimming pool. Lighted downhill course 500m. Surroundings is ideal for tourism or cycling. 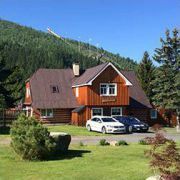 Cottage is situated at the beautiful place in the centre of Harrachov, accessable by car, parking by the object … More » in the winter time. 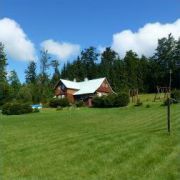 Cottage has 5 new rebuilt apartments (kitchen, bathroom, TV), common room with fire place, children room, WiFi. Capacity 16–21 persons, private garden, outdoor pool. 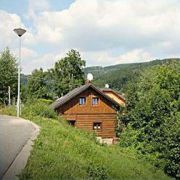 New wooden house (finished in June 2018) for your holiday in village Záhoří, part Dlouhý, under the highest mountain … More » of Bohemian Paradise, Kozákov (744m above sea level), on the border among Bohemian Paradise, Giant Mountains and Jizera Mountains. 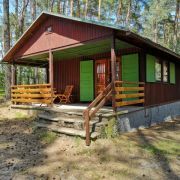 Groupage of four spacious cottages in piny wood near the village Hamr na Jezeře, by the natural lake with sand … More » beach. Ideal for family or groups to relaxation, cycling or hiking. 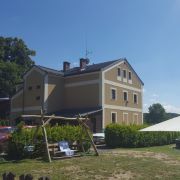 Typical reconstructed semi-timber cottage for 12 persons (max. 16) near the ski lifts in famous ski centre Paseky … More » . Ideal considitons also for hiking and cycling. Sauna in cottage. Several golf courses in surroundings. 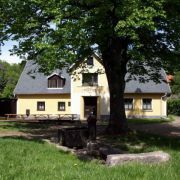 The cottage Piktych is situated in a quiet part of spa-town Lázně Libverda, accommodation (2-6 beds rooms) with … More » own cooking. Ideal for groups to 31 persons. The cottage is rented for one group (outside the heating season possible exception).